Thunder and Ann Judge-Wegener. Photo courtesy of The Arabian Horse Association. The way the guest list reads for this weekend’s XLVIII Super Bowl, you might think the event has less to do with football and more to do with our four-legged and feathered friends. The first two are understandable considering the teams that will be playing in the game. However, the last one might throw some people for a loop; that is, unless you’re familiar with “Thunder” the Denver Broncos mascot. Thunder is a purebred Arabian gelding that, according to the Denver Broncos, “displays his impressive canter from one end zone to the other,” when the team makes a scoring drive or touchdown. Per Thunder’s official media bio, the original Thunder, KB Kobask, was the mascot for 11 years before he retired at the beginning of 2004. Signing autographs is just one part of a celebrity’s job. Ann helps Thunder out because those horseshoes can be a bit tricky. Photo courtesy of Arabian Horse Association. But in all actuality, Thunder II isn’t the horse making the trip. Representing the Denver Broncos at the 2014 Super Bowl will be Thunder II’s protege, Me N Myshadow, or Thunder III. This will be Judge-Wegener and Thunder III’s first trip to a Championship game as a team, and they are more than excited. 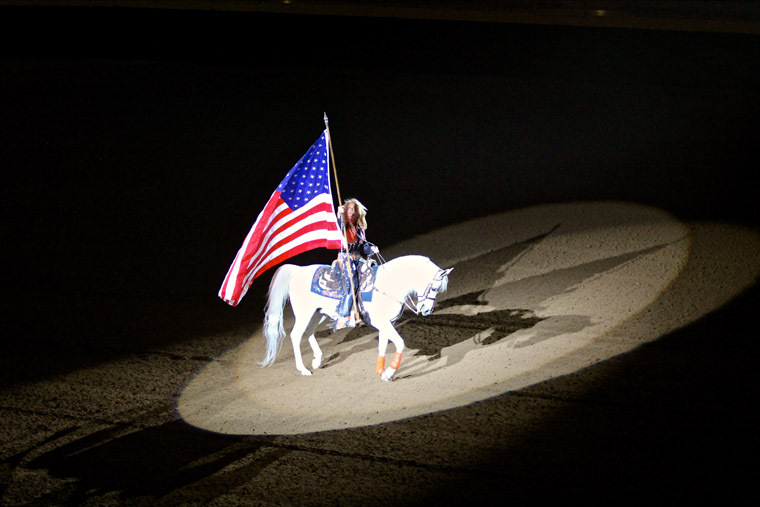 The Arabian Horse Association caught up with the pair at the recent National Western Stock Show in Denver, Colorado where they participated in the Dancing Horses performances and carried the American Flag in the grand entry. 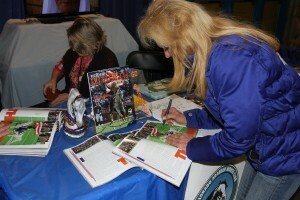 After performances, the duo was available for photos and autographs at the Colorado Arabian Horse Club booth. Thunder carrying the flag in the National Western Stock Show grand entry. Photo courtesy of Arabian Horse Association. 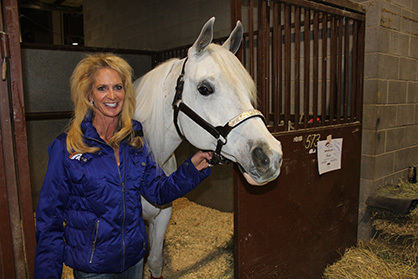 Along with serving as the face of the Denver Broncos, Thunder has an important job as a breed ambassador for the Arabian Horse population. Given his well-deserved celebrity status, Thunder will be traveling in style to the big game in a specially designed plane much like those used to transport international competition horses overseas. The size of his stall, the temperature of the plane, and other important details concerning the cabin atmosphere and experience of the flight have been considered to ensure that Thunder arrives well-rested and ready to perform in New Jersey. Although not confirmed, rumor has it that Thunder might be enjoying some inflight service in the form of some complimentary carrots and hay to help the time pass during the flight. In Denver, Thunder celebrates the team’s touchdown drives by galloping up and down the sidelines, but what will his duties be at the Super Bowl this weekend? Although it hasn’t yet been announced what Thunder will be allowed to do during the game, some high-ranking official indicate he might be leading the team’s initial charge onto the field. In that case, tune in for the first few minutes of the game to see Thunder in all of his glory! Special thanks to the Arabian Horse Association for providing helpful information and photos for this piece. For more information about AHA visit www.arabianhorses.org.